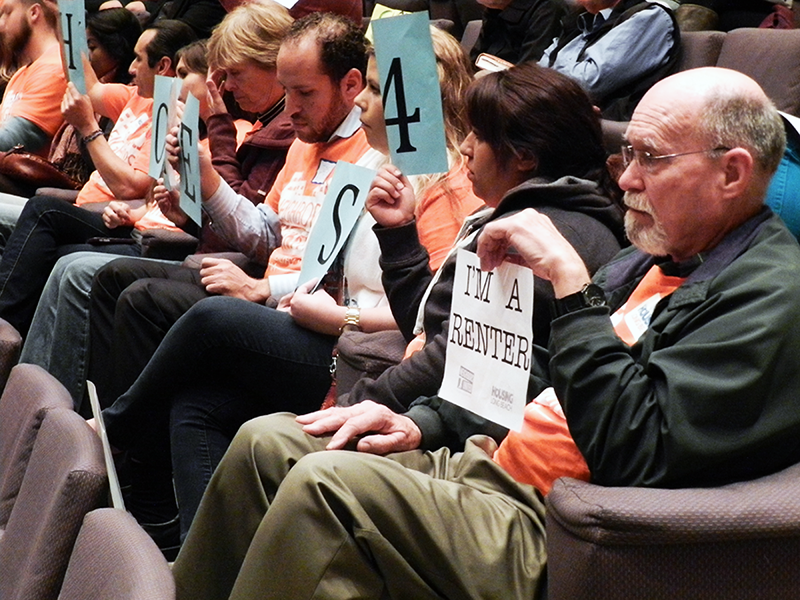 After months of meetings with city staff, rallies to City Hall and impassioned, sometimes tearful testimonies before the Long Beach City Council, the renters of this city will finally have their voice addressed. However, when the council votes next week to amend the city’s municipal code to include a staff recommended proactive inspection program, it won’t be the vote renters and housing advocates have spent years fighting for. At its next regular meeting, the council is scheduled to adopt the Proactive Rental Housing Inspection Program (PRHIP) as an update to the 2013-2021 Housing Element that was approved at the start of this year. The program would codify an existing program in which code enforcement officers inspect a set number of multi-family living units in an effort to address habitability issues within the city. Gone from an earlier version of the city staff’s recommendations are provisions for $75,000 in annual education and outreach efforts and an additional adoption of the State Franchise Tax Board’s Substandard Housing Program. 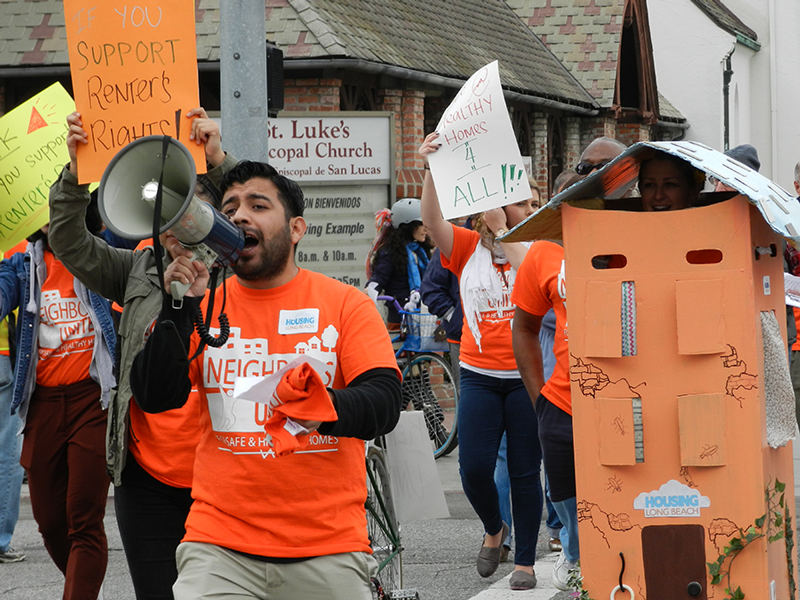 For organizers at Housing Long Beach (HLB), the grassroots advocacy group that has pushed for a stronger Rent Escrow Account Program (REAP), the vote will fall short of what it will take to combat problem landlords in the city. Following the release of a memo from city staff last month that painted the REAP program as illegal and prohibitively expensive, organizers at HLB called into question the math that city staff based their recommendations on, and if it would indeed be as expensive as they predict. The memo showed that while Long Beach has a fraction of the rental properties in Los Angeles, the city that staff chose as a comparison point, based on an economy of scale calculation it would cost the city $2.3 million to run the REAP program in its first year. Los Angeles, which has run the program for over 30 years and has more rental properties (760,000) than Long Beach has residents (about 470,000) operated on a $1.8 million budget for last year. Outgoing executive director Kerry Gallagher accused city staff of using a confusing acronym for its proposed program that was to similar to the REAP program her group was advocating for. She also said the choice to use inflammatory, divisive phrases like “rent control” was both inaccurate and a damaging to what the group was trying to accomplish. Her reference came from a letter written by City Attorney Charles Parkin who claimed that there was no legal mechanism for Long Beach to institute the program because it lacked rent control. Several cities including Baltimore have REAP programs without rent control in place. “A guaranteed way to kill any housing policy is to say the words ‘rent control’ because that scares people away,” Gallagher said. The REAP program that his group had been pushing for would provide a safe gateway for renters in the city to request living conditions be fixed by their landlord without the fear of retaliation. The program has already been adopted in cities like San Francisco, Baltimore and Los Angeles, providing a legal avenue for tenants to legally withhold rent from landlords by placing it into an escrow account until repairs are made and certified by the respective cities. The program also prohibits retaliatory acts like raising rent or evictions by the landlord, something the proposed PRHIP program does not. Staff maintained its view that the program was prohibitively expensive despite their acknowledgement that the first year of the program would inherently be more expensive due to one-time set up costs and that the large budget was written assuming that each case would result in the landlord taking the city to court. The budgetary issues facing the city in the coming years have made the expenditure of any funds, however large or small, subject to increased scrutiny. Several council members have expressed wanting to protect the city’s residents from bad landlords but stated that cost would weigh heavily on their votes. The staff’s memo also pointed to the success rate of its existing proactive inspection processes and a series of escalating fines, ones that Reynolds said result in a 90 percent compliance rate within 120 days of the reported issues. However, the Housing Element highlighted that the city only aims to inspect a fraction of the over 90,000 multi-family homes in the city. Under the proposed PRHIP program, those inspections would be limited to buildings with four or more units. In 2012, the city performed just over 2,500 of its stated goal of 5,000 proactive inspections, meaning that tens of thousands of units went without inspection. In the staff memo, it was indicated that the number of units that had habitability issues in the city was under 600 units, which represented .007 percent of the rental stock. However, when accounting for the number of units actually inspected, that number actually reflects a figure between 10-20 percent. Under the proposed PRHIP program, those inspections would be limited to buildings with four or more units, which would leave gaps in rental units being subject to inspection. In an email correspondence from April, Deputy Director of Development Services Angela Reynolds addressed that particular shortfall of the PHRIP program, stating that California law prohibits retaliation by landlords. She added that “it is not within the city’s purview to address legal matters between tenant and landlord” and that the city typically refers tenants to legal aid when those instances arrive. According to Gallagher, when tenants take an eviction battle to the courthouse they run the risk of losing and having a damaging eviction mark on their credit report that could last up to 10 years and make it near impossible to find another landlord willing to rent to them. Due to that and the high cost of legal fees, most tenants who face evictions in the wake of making complaints to code enforcement don’t pursue the litigation option. The vote won’t signal the end of the group’s campaign to level the playing field between Long Beach renters and the handful of problem landlords who skirt the rules and dangle higher rents and evictions over tenants’ heads if they choose to report bad living conditions. Butler said that his group will be in attendance next Tuesday and they will present a compelling dialogue, one they hope the council members listen to, unlike their efforts with city staff. He added that it shouldn’t be okay with anyone’s conscience that some people live in conditions reminiscent of a third-world country.